It is the fourth of July, a special time for Americans celebrating Independence day! So while America might not have a perfect bill of moral health, you can’t deny the pride and patriotism in the greatest country on the goddamn planet Earth- ‘Mer’ca. So we decided to show our patriotic stripes and assemble the most American, patriotic comic heroes that ever existed ever. Prepare to be dazzled with stars in your eyes. Red Dugan of The United States Marine Corps. Whitey Smith of the Army. Blooey Blue of the Navy. They all come together in a effort to fight the Evil Axis in World War II. God we couldn’t make those names up. Though they were essentially agents of notorious bad guy Lex Luthor in Kingdom Come, you can’t deny their colour and costume coordination shows their love for their home and teamwork. Originally known as the second Star-Spangled Kid, Courtney Whitmore began using the name “Stargirl” after she was presented with the Cosmic Staff by Jack Knight. Considering how the she started the superhero gig just to piss off her stepfather Pat Dugan, by wearing the original Star-Spangled Kid’s gear, she made a real thing out of the superhero deal, joining the Justice League and rocking the star-bangled uniform with finesse. The Star-Spangled Kid was Sylvester Pemberton, a Golden Age character, created by Jerry Siegel, the co-creator of Superman. He became the Star-Spangled Kid in order to battle Nazism during World War II. He was unique in that he was a kid superhero who had an adult sidekick, Stripesy a.k.a. Pat Dugan. Both he and Dugan were superb acrobats along with having sufficient training in hand-to-hand combat, but the two regularly bickered about which of them should get top billing. The guy that pointed at you from that war propaganda poster invoking shame i onlooking men for wussing out when it came to the draft, yep that Uncle Sam. But in a comic. He is the very personification of the United States original part of Quality Comics imprint in the 19 before being acquired by DC Comics. Uncle Sam under DC then became a spiritual entity created through an occult ritual by the Founding Fathers. Not very Christian, sure but his white beard just screams unearthly power. Like a wizard. Or the guy that can make moonshine out back in his tub home-constructed brewery. Eli Bradley was grandson of Isaiah Bradley, the black Captain America. 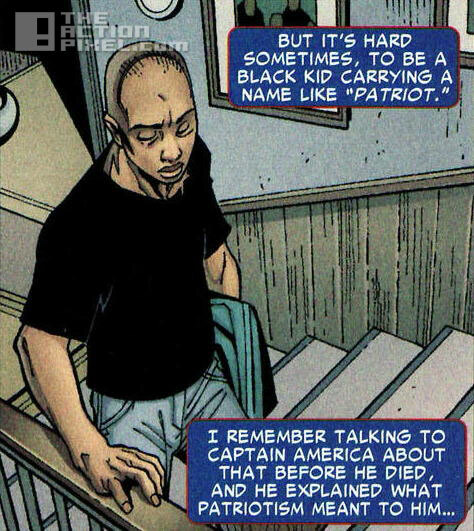 Isaiah had received his powers as part of an early Super Soldier Serum experiment tested on African-American men in an attempt to reproduce the formula lost after being used to turn Steve Rogers into Captain America. Of course we could go into the parallels of the Tuskegee Experiment… USA! USA! A bit race-y (and we mean that literally) Captain Marvel Jr in the 40’s proved to be the left arm of America’s might and anger. We get it. Pearl Harbour was a catastrophe. But what followed was an angry kid taking out Japanese ship fleets by hand-throwing missiles, taking on offensive characterisations of Japanese people and the ever-so-infamous Captain Nazi. As you would expect, being the 40’s and at the height of World War II. Freddy Freeman may be in the shadow of Captain Marvel, but Captain Marvel Jnr. represented the fighting spirit of America at war. A few women have dawned the moniker, but whether we are speaking of Libby Lawrence or Jesse Chambers, you can’t deny superheroine liberty Belle really was the embodiment of the American Spirit. Liberty Belle’s powers of enhanced speed, strength, and stamina were linked to the ringing of the Liberty Bell in Philadelphia. Definitely from a long line of pin-up dolls that could be posted on the nose of a plane bomber of the same name- Liberty Belle. An embassador for Themiscara in the US, Wonder Woman’s costume took on the elements of the American flag to show respect to the country she would be living and operating in. The rest is history, as not only was she prominent in World War 2, but she has become a symbol for feminism the world over, within and without the comic universe. Okay, so Superman technically isn’t American, and the Michael Bay of Instagram filters Zack Snyder portrays the Man Of Steel as a unwelcome alien in upcoming film Batman V. Superman: Dawn Of Justice, but rest assured he is as American as they get. You’ve never really visited America unless you were in a state that does not have a coastline. And Clark Kent aka Supes grew up in Kansas, dead in the middle of America’s heartland. In fact we would say he is more than American. More like an ideal all Americans want to aspire to. Superman foiled the plot of a super-weapon falling into the hands of the Evil Axis (narrative that ran in the 40s, literally and eerily printed days before America dropped the nuclear bomb on Japan and any such weapon being known to the wider public). 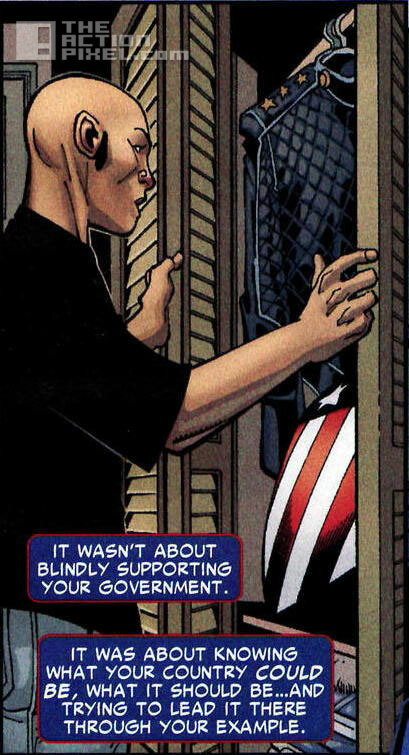 So his costume may not be comprised of the star-spangled banner, but rest assured he is one of the good guys. If comic heroes ever wanted an aspiring role model to look up to on how to be a patriot and love your country with unquestionable servitude, they would only have to cast their eyes on this guy. Steve Rogers. The Captain America. His costume should be enough to show you how much he loves America. Star, stripes and all. Armed with a shield, and the strength and ability cast upon him via a super-soldier experiment via a serum which was essentially steroids on crack. The Cap’n will defend and fight for every single American. The guy even punched Hitler in the face. What’s more American than that? America isn’t perfect. But hell, its better than a lot places in the world. And when it comes to most of our patriotic heroes, being a patriot is never to have blind allegiance to governments or corporations, but rather holding them accountable and doing what is right by the majority, not the minority. Happy 4th of July! USA!